If your family enjoys savory food, rather than sweet, then here’s an easy jar mix that they are sure to enjoy. This recipe is not only easy to layer in the jar, it’s also very easy and quick to cook as well. Serve this versatile dish warm as an accompaniment to fish or meat, or add some diced cucumber and red peppers, olives and feta cheese and serve with balsamic vinaigrette as a salad. I’ve made a free printable gift tag for this project, which includes cooking directions for the gift recipient. Layer all the ingredients, except the nuts, in the order given, in a one pint jar. Place nuts in a small plastic bag and seal. Place bag on top of the couscous mix. 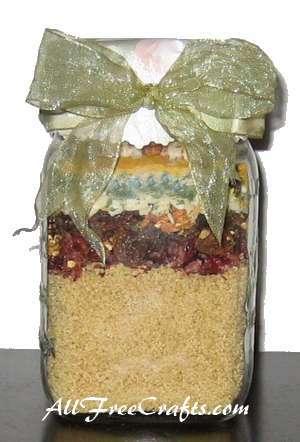 If there is a little space left in the jar, fill the space above the bag of nuts with crumpled tissue paper or parchment paper to prevent the ingredients from moving and disturbing the layers. Screw on the jar lid and fasten tightly. Cut a circle of pretty paper or fabric to cover the lid and fix this in place with a rubber band. Cover the rubber band with ribbon, attach gift tag, and finish with a bow. 1. Remove bag of nuts from the top of the jar and set aside. 2. Measure 1½ cups of water into a medium saucepan. Add 1 tablespoon of butter or olive oil and the contents of the jar. Stir to combine and bring to a boil. Remove from heat, cover, and let stand for five minutes. 3. While couscous is cooking, toast the nuts by spreading on a baking pan and baking in a preheated 350° oven for about five minutes, or until nuts are golden brown. 4. Fluff up couscous with a fork and stir in the nuts. Serve warm, and garnish with a sprig of fresh parsley. Or let cool, add diced cucumbers and sweet peppers, olives and feta cheese and serve as a salad with balsamic vinaigrette or a similar salad dressing. If you wish, you may download and print a free label for your Couscous Jar Mix. 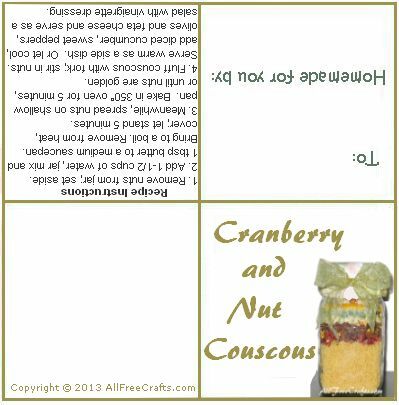 The label provides cooking instructions for the person receiving your gift and serves as a handy gift tag as well. Just print the full-size label, cut it out, then fold into quarters, so the cooking instructions are on the inside and the copyright is one the back. Simply punch a small hole in the top left corner of the tag to tie it to your jar.